The Wild won their fourth straight on Friday night, while the Canucks suffered their eighth loss in their last nine games. VANCOUVER, British Columbia — Justin Fontaine’s goal in the seventh round of the shootout gave the Minnesota Wild a 2-1 win over the Vancouver Canucks on Friday night. Fontaine went wide on Eddie Lack and slid the puck under the Vancouver goalie. Darcy Kuemper preserved the win by denying Vancouver’s final shooter, David Booth, as he attempted a spin-o-rama shot. Earlier in the shootout, Vancouver’s Chris Higgins had Kuemper down and out after a deke, but hit the post. The Wild won their fourth straight, while the Canucks suffered their eighth loss in their last nine games despite outshooting Minnesota 31-23. Vancouver’s Ryan Kesler and Minnesota’s Zach Parise exchanged first-period goals. Kesler, who missed Thursday’s win over St. Louis with a hand injury and has been the subject of trade speculation, opened the scoring 5:19 into the game while the Canucks were short-handed. After Chris Higgins forced a turnover just outside the Vancouver blue line, Kesler raced down left wing and beat Kuemper with a high shot. The goal came while Daniel Sedin was serving a hooking penalty. Minnesota had a goal by former Canucks defenseman Keith Ballard disallowed as officials ruled Mikael Granlund interfered with Lack, but no penalty was necessary. Parise evened the score just under nine minutes later as he beat a heavily screened shot from the slot. The Wild captain put the puck between Alex Edler and Dany Heatley as they stood in front of the net. The Canucks outshot the Wild 11-6 in a scoreless second period, but could not beat a steady Kuemper, who made his 14th consecutive start. Early in the third period, he robbed Kesler while sprawled on his belly. After Kesler picked up the puck, cut in front of the goalmouth and sent a backhand toward the net, Kuemper lifted his right leg and kicked the puck out. The Canucks controlled play for much of the third, but struggled to generate serious chances against Minnesota. The Wild only recorded its second shot of the period with 2:59 left, but still managed to force overtime. 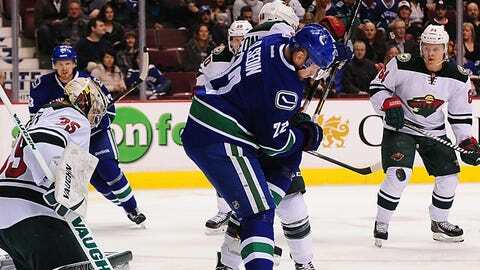 The Canucks received a rare power play 1:27 into the extra session as Parise was penalized for boarding Chris Tanev. NOTES: Tanev returned after missing seven games with a thumb injury. … Wild captain Mikko Koivu remained out with an ankle injury suffered Jan. 4, but took part in his club’s morning skate. He has missed 17 straight games. … Most of Vancouver’s injured players have returned. Only F Mike Santorelli (shoulder, out for season) and D Andrew Alberts (concussion) remain out. … Minnesota left wing Jason Zucker missed his second consecutive game with a lower-body injury while Marco Scandella sat out his third contest due to a sprained knee.